The Pit River is the largest river in northeastern California; its watershed is 4,324 square miles. 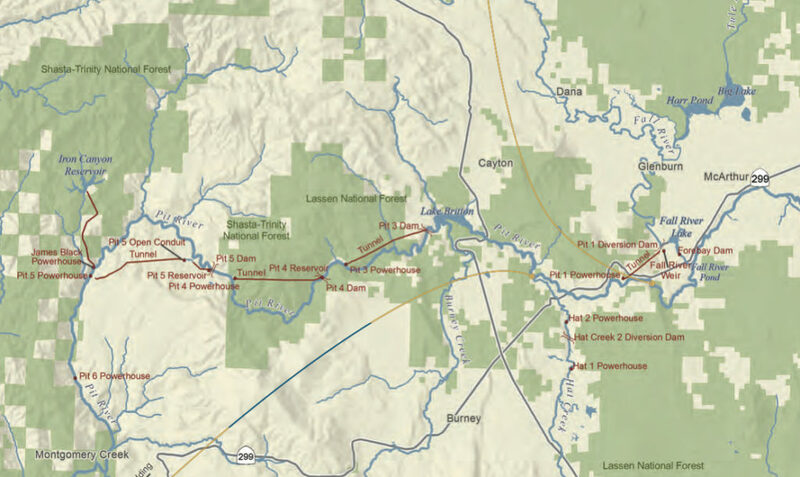 The mainstem Pit flows in a southwesterly direction through valleys and basalt canyons to Shasta Lake, where it eventually flows into the Sacramento River and San Francisco Bay. The Pit River is heavily dammed for hydropower, and Pacific Gas & Electric (PG&E) holds several operating licenses in its system. The Pit projects are numbered by their age and upstream to downstream. The most upstream project, Pit 1, began construction in 1920. From 1923 to 1926, licenses were issued to construct Pit 3 and Pit 4 developments. 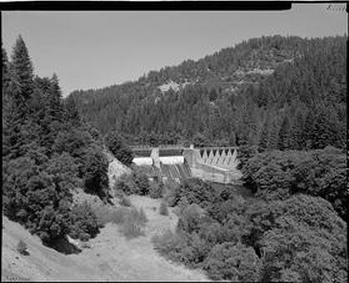 In 1942, when PG&E renewed the license for Pit 3 and Pit 4, it also received authorization to construct Pit 5. Pit 6 was completed in 1965, the same year the James Black powerhouse was finished. These dams, powerhouses, and diversions are captured under two operating licenses, “Pit 1” (FERC P-2687) and “Pit 3, 4, and 5” (FERC P-233). Each of these Pit developments involves at least one dam, a tunnel that carries diverted water out of the river, and a powerhouse – where power is generated and the water is returned to the Pit River. In the Pit 3, 4, and 5 developments, all of the tunnels are just over four miles long. This re-plumbing of the Pit River channels water around a combined 30 miles of natural riverbed. 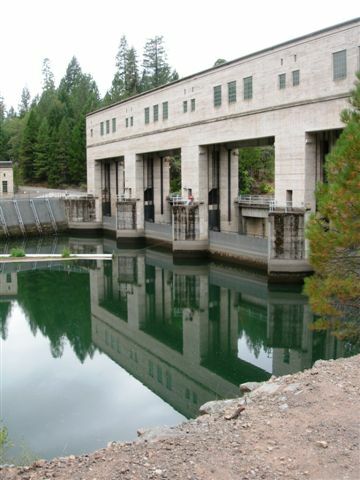 The Pit 4 Diversion Dam is important as an original feature of the Pit 3, 4 and 5 Hydroelectric Plant. 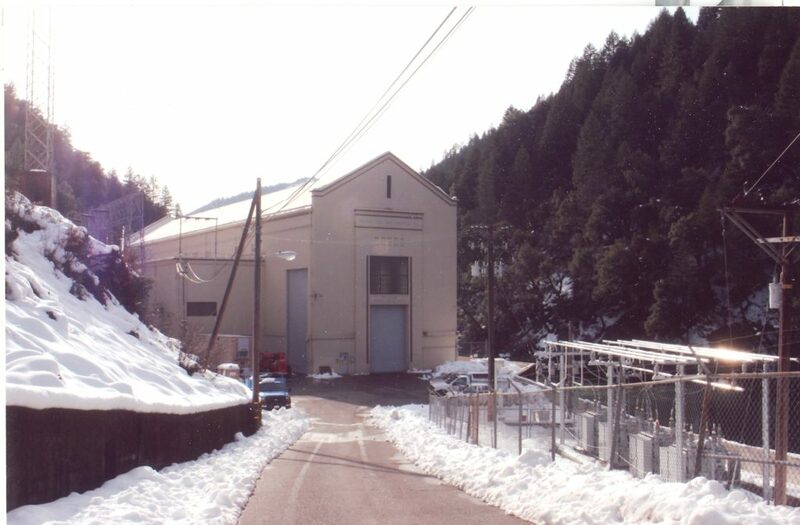 Pit 4 Dam is an excellent example of early twentieth century hydroelectric architecture and represents the original aesthetic design characteristics of the overall Pit River system, while also unique and designed as a separate, individual feature. The system and the dam itself reflect a higher degree of architectural aesthetics than projects built in later years. Its impact on California has been significant, helping to wipe out one of the world’s largest salmon runs, supporting and encouraging the industrial development of Northern California and especially the San Francisco Bay Area. 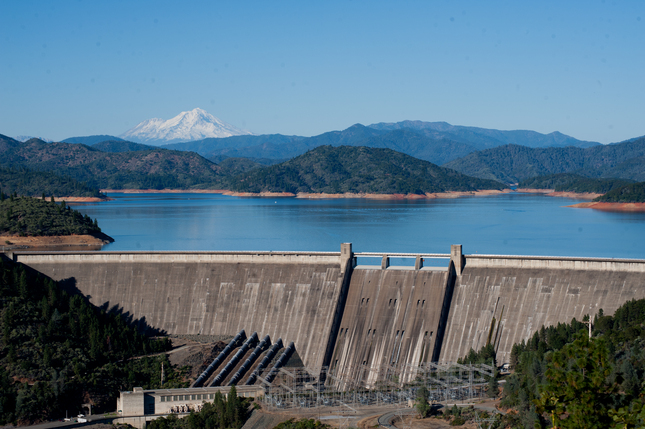 Electricity from the Pit River has powered the growth of the state just as hydroelectric construction helped develop the economy of Shasta County. This remote system has had far-reaching effects and continues to remind us of a time when the river ran free and wild. By the time the Pit 1 operating license expired in 1995, PG&E had few environmental requirements. The Pit 1 forebay, only 12 to 15 feet deep, fluctuated as much as 3 feet per day in response to power demand. No minimum flows were required in any project reaches, leaving over 8 miles of the Fall and Pit Rivers dewatered and river levels downstream from the powerhouse highly unstable. 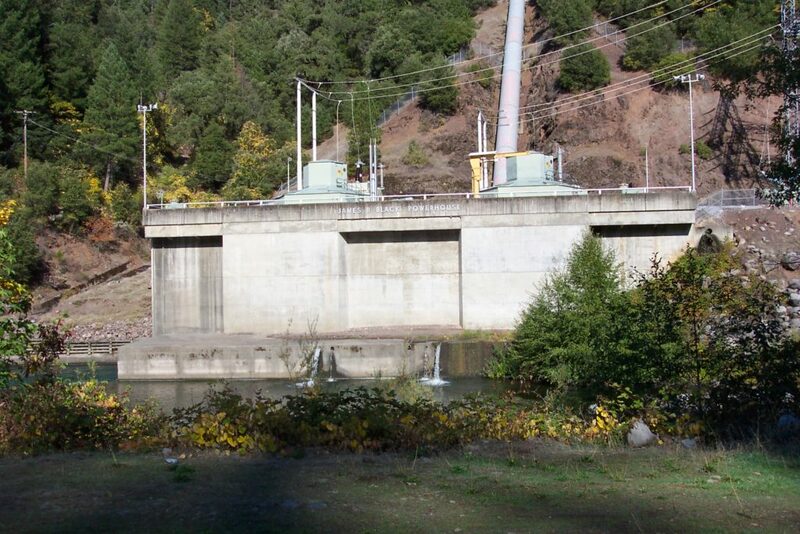 As required by the new Pit 1 license issued in 2003, PG&E releases steady water into the Pit River Canyon, and new release rates for the powerhouse slowed unpredictable fluctuations and curbed streamside erosion downstream. Punctuated flushing flows control unwanted vegetation from encroaching into the river channel and serve a dual benefit as a special whitewater release in the summer, and fall whitewater flows were implemented in 2011. For the first eighty years, the project had operated with no flow requirements. Since 2003, thanks to the new license, there is more balance. When the Pit 3, 4, and 5 license was set to expire, PG&E adopted a new strategy: convene negotiations and create an agreement to settle principal issues. Convened in 1998, the Pit River Collaborative Team (PRCT) produced a settlement in 2003 that forms the framework of a new 2007 license. The license term – 36 years – is set to end at the same time as the Pit 1 license, for maximum coordination of the Pit River. Several interests directed the licensing agreement. Bring water back into 22.5 miles of the Pit at slower naturalized rates. Enhance the top trout fishery in the Pit and in Hat Creek. Ensure that recreational resources – including fishing, whitewater, and the Pacific Crest Trail – were protected. The PRCT agreement established new minimum flows at double or more the previous minimums. It also prescribed seasonal variation and a 0.5 foot-per-hour rate of change in releasing the flows, to mimic a natural hydrograph. These renewed flows and key habitat enhancements such as gravel replenishment and transporting wood downstream from the reservoirs will improve conditions for fish and wildlife. To be sure, PG&E will monitor aquatic life and water quality extensively over the life of the license, guiding adaptive management decisions for the river. Through the settlement talks, key parties also resolved protection of the Hat Creek Wild Trout Management Area. Established in 1969, the Area is the first state-designated Wild Trout Creek. At the base of its 3.5 mile length, the state constructed a barrier dam to prevent the warmwater fishery of Lake Britton from invading the prized coldwater trout fishery. A separate 2003 agreement, partially incorporated into the license, commits PG&E to funding 50% of the costs to maintain the barrier dam, and to providing $300,000 toward stewardship management over the next 30 years. On Thursday, August 9th, 2012, American Whitewater and Friends of the River notified the Federal Energy Regulatory Commission, U.S. Fish and Wildlife Service, and PG&E of their intent to sue for violations of the Endangered Species Act at the Pit 1 and Hat Creek Hydroelectric Projects in California. The projects have numerous impacts on the endangered Shasta crayfish and have been in violation of the Endangered Species Act since 2005. As the Pit River flows out of Northern California’s Lake Britton, it first begins its journey to Lake Shasta through a 30-mile scenic watershed divided into five segments, or reaches, each created by a dam. Barnard’s project entailed installing an 8-foot-diameter pipe and appurtenances through Dams 3, 4 and 5 to increase the river’s flow as part of a relicensing agreement with the Federal Energy Regulatory Commission. Penetration of each dam involved coffer damming, core drilling, and demolition, as well as structural analysis of the penetration itself. Collaboration between the Owner, Designers, and Barnard personnel resulted in various value engineering opportunities. Installing the 30-foot-tall structural steel intakes and custom-made knife gate valves required work on the water and diving depths up to 100 feet deep. The project began in Spring 2008, working on the design with Devine Tarbell & Associates. Valvehouse construction required soil nails and rock bolts during foundation excavation, drilling 30 to 70 into the hillside, as well as shotcrete support walls. We installed #10 ksi bar with double corrosion protection and followed up with load-testing. In addition to the flow modifications, the project added 38 turnouts to the existing River Road, replacement of two bridges, drainage system upgrade, and recreation improvements throughout the Pit River watershed. All of this work took place in a highly sensitive environment under close scrutiny by regulatory agencies. Shasta Dam- THE BIG ONE! WE MUST FIND A WAY TO LET THE SALMON BACK INTO OUR PRECIOUS SACRED AHJOOMAH WATERSHED!! !